Join us on the Rhône as we drift through provincial wine lands dotted with spirit-lifting heritage towns and ancient cities whose cobblestone streets bristle with culture and epicurean tradition. 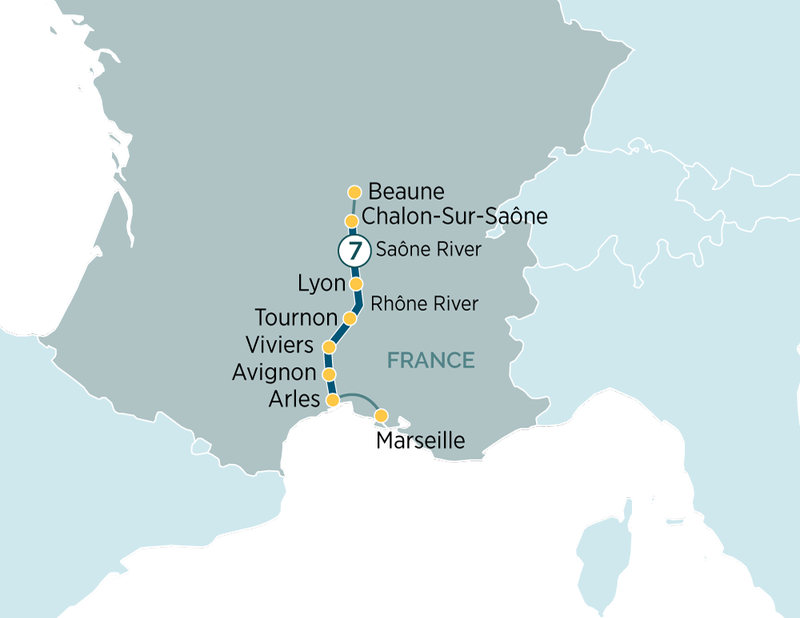 From Lyon to Arles over eight wonderful days, discover the wine-making customs of Chalon-Sur-Saône, the half-timbered charm of Mâcon, and the Roman-age splendour of Arles, all while cruising in effortless contemporary comfort on-board your Emerald Waterways Star-Ship. This memorable sailing introduces southern France in all its iconic style and splendour, from the revered vineyards of Beaujolais to the jovial bouchons of Lyon, the acclaimed culinary capital of the world. Your tour starts in Lyon, France’s third largest city. Feel the city’s heartbeat during a guided tour, which begins with a drive to the hilltop church of Basilique Notre Dame de Fourviere and concludes amid the byways of the old town, where gastronomy is all. This evening, sail north through Beaujolais to Chalon-Sur-Saône while savouring an on-board cheese and olive tasting, one of several EmeraldPLUS events scheduled for your journey. History and culture come easy in Avignon, a Celtic city that’s renowned as the seat of the Palais des Papes, and in Arles, whose World Heritage-listed centre boasts some of the finest Roman architecture outside of Italy. It’s here where your trip reaches its conclusion, but not before raising a glass of fine French wine to toast the end of an inspiring journey. Return economy flights from one of up to 15 UK regional airports are included in the price of your holiday. Please call us to check if we can offer your local airport. If you’d prefer not to fly, return travel via Eurostar is available. After breakfast, it is time to say farewell to your fellow passengers and disembark the ship for your transfer to Marseille airport. Your flight home is included in the price of your holiday. Please call us to check if we can offer your preferred airport. If you’d prefer not to fly, return travel via Eurostar is available.